Having a photo shoot – this was an absolute blast and the few shots I’ve seen I absolutely love, it was playful and enjoyable! I love this shot! Healthy Vision Photography did an amazing job! Being in the best shape of my life – by far! Getting to understand just how lucky I am to have my wonderful boyfriend, he was more supportive and helpful than anyone has a right to expect and I cannot possibly thank him enough for all his help and love throughout this process. This is the most important one – well and truly loving the way I look. If you have read The Whole Story you know that I have had a relatively rocky relationship with my body and food in general. I was really worried about going on such a strict diet because I have a tendency to obsess and go way into the realm of crazy. But I didn’t! Yay! I kind of cried a little the morning after the competition when I realized how long I have spent not liking my body and realizing that from day 1 of this process (not just at the end) I have truly loved my body for what it was able to do, how it looked, and what I was doing for it. Being judged solely on my appearance – I realize that this is the WHOLE point of this competition, but I can honestly tell you this hadn’t occurred to me before it was actually happening. It blind-sided me. Please if you are going to do a competition, prepare yourself for this! If is hard to hear that you aren’t good enough based only on your looks even when you volunteer for it. Wearing heels and arching my back all day… my quads were burning from the posing! See that arch? It is hard! The rebound from food and water depletion above. I had some really salty foods and a lot of water the next day. It was not even that large a quantity (I mean it was a lot compared to the diet, but not an insane amount) and I actually ended up throwing up! I am 100% convinced this was from the sodium and water imbalances in my system! If I do another competition I will try to remember that and add sodium back in a little slower. So obviously there are a lot more pros than cons, but that being judged one really threw me for a loop! So please be prepared for that. On a different note, tonight I made black bean brownies a la Chocolate Covered Katie with the modification of using butter instead of oil, maple syrup as the sweetener and topping it with dark chocolate, white chocolate chips and a sprinkling of coconut. 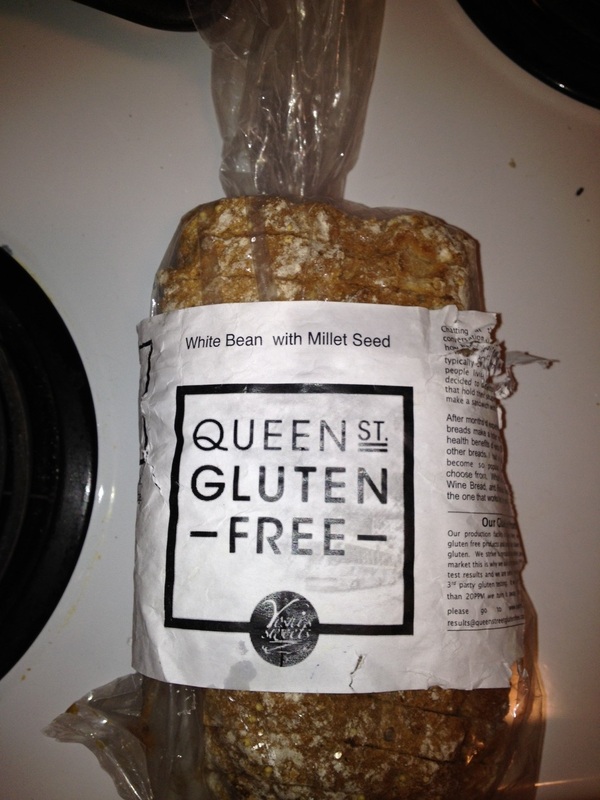 They were delicious AND healthy – gluten-free (if you use GF oats or you can sub for a different GF flour), egg-free, milk-free, and nut-free. Awesome right? They were such a nice texture and a great level of sweetness. Of course the Haagen Dazs I topped it with was less healthy, but shhhhhhh! I also made monkfish for dinner which is something I will post about tomorrow because I feel like not enough people now what or how amazing monkfish is! Last thing – I did my first workout after the competition and it was super simple, but awesome! I think I’m going to drop the workouts to 3-4 times per week for the next little while and I will post what I did tomorrow along with the fish stuff k? Check out Jennifer Mota’s blog about her first competition experience at UFE Halloween mayhem too! Along with Primal Competitor who actually placed 3rd, because she rocks, in her first ever bikini competition with the NPC and is moving up to the regional level… woot woot! And just for good measure, also check out Lisa at Figure 911 who is far more experienced but no less amazing and has her last competition of the season coming up… good luck girl! After a successful fast yesterday and a 5 pound drop between Monday morning and Tuesday morning (that will be mostly water weight with maybe .5 lbs of fat) I am back on plan and feeling pretty motivated. 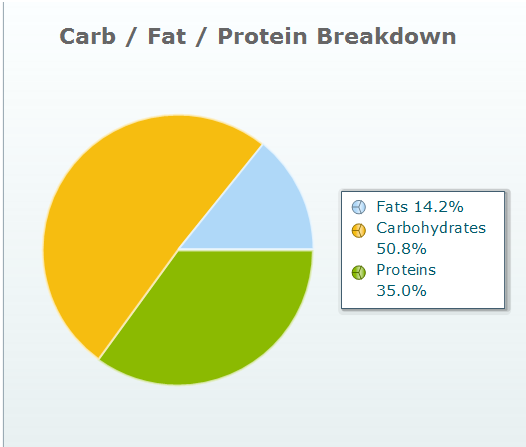 I had decided to cut my carb intake for the next 2 days and do a carb refeed on the 3rd, then cycle my carbs like this for 2 weeks while maintaining my calories at a relatively high level. All this sounding complicated yet? As I’m thinking about doing this it occurred to me that all of this information will be useless to most people because most people barely understand what macronutrients are and what their purpose is in the body.The example I usually use with people is that of building a house: Protein = bricks, carbohydrates = the workers, fats = mortar (most of the time, but I’ll get into that later). This forum gives a pretty good explanation. Your body’s preference is to use carbohydrate for energy (the workers). Carbs provide 4 calories per gram and are converted into energy easily by your body. There are fast acting carbs (sugars and fruits) and slow acting carbs (Whole grains, vegetables, roots and nuts) and these can both be used depending on the type of energy your body needs. Before a run you can eat a piece of fruit for immediate energy and have a sweet potato for long lasting energy. A measure of how fast a carb is absorbed is the glycemic index with can be looked up for all sorts of foods here. Carbs also create an insulin response based on the glycemic index as well as the glycemic load (the total amount of carbs). Insulin has a large impact on how your body burns fat and processes carbs and fats, but is a very complex topic that is best addressed on its own. If you want to learn more go here. Proteins are used to build muscle and lean tissue in your body, repair organs and can be used for energy, but that is not the bodies preference and it requires more conversions that carbs and can be hard on the liver and kidneys if this is the only source of energy. Proteins also provide 4 calories per gram. There are different types of fats, mainly; saturated, polyunsaturated and monounsaturated fats. There are also cholesterols and trans fats which have a pretty bad rap. Fats unlike protein and carbs provide 9 calories per gram and are therefore more energy dense. Fats are the main source of fuel for your brain and very low fat diets will decrease mental acuity and make you feel “foggy”. Certain vitamins are also only soluble in fat and foods are generally processed more effectively in the presence of fat. Fat promotes satiety (feelings of fullness) and adds flavour to your food. There is a lot of talk about “good fats’ v. “bad fats” and in general people would classify saturated, trans and cholesterol in the bad camp and poly and mono-unsaturated fats in the good camps with omega 3’s and CLA being the starts of the show. CLA and Omega 3’s are also present in saturated fats (fats from animals or coconuts and some other plants) if they are good quality (i.e. pasture raised meats). So that your house of macronutrients with protein as the building blocks for your lean tissues, carbs providing the energy to keep going and rebuilding as things are broken down and fats holding it together by allowing things to be processed and when necessary providing the energy if carbs aren’t available. Carbohydrates – Carbs basically make up the remaining calories (calories are a whole different part of the equation which I’ll cover another time)… if you are trying to gain weight then add carbs, if you are trying to lose weight, decrease carbs with a minimum of 1 g per pound of bodyweight in the long term if you are active, lower than that and you’ll have some nasty side effects like grouchiness and bad breath, not to mention possible liver and kidney damage if you are replacing it with saturated fats. All of these amounts can be manipulated in the short term and all of these are based on averages. So if you don’t get enough protein one day then just eat more the next… it’s ok to do that! A good place to read more is Bodybuilding.com in this forum which also discusses calories and how to determine an appropriate calorie range. You might have heard a lot of talk about percentages and ratios of carbs: protein: fats but I like to work in grams because when you change your calories, your macro requirements don’t actually change. But if you are staying in the same calorie range then percentages work fine (i.e. the Zone diet is 40:40:30). So what the heck am I doing? Fats – .4 grams * 115 lbs = 46 grams/day min – 115 grams/day max. Remember I talked about averages? Well (250+60+80)/3 days = 130 grams/day which is just shy of my minimum and at my minimum if I calculate at my ideal bodyweight of 130 lbs. This method keeps my body guessing and forces it to use my own body fat for fuel on the low carb days and then on the high carb day I “refeed” my muscles and replenish their glycogen stores (stored carbohydrate energy) so that I don’t start using my muscle protein for energy. It’s an interesting system and requires some food tracking and dedication, but I am excited to see how it works 🙂 I’ll keep you posted. 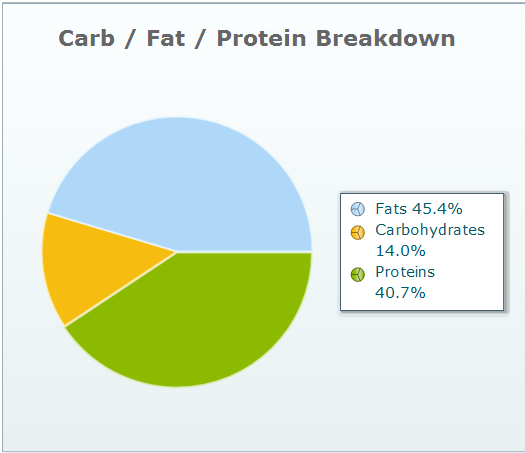 If anyone has questions about macronutrients let me know!